The start of the 28th sermon is marked by a large green, blue, and red initial, with penwork flourishing in blue. In the upper margin are the column letters 'o' and 'p', the sermon number '27', and between the columns are line numbers (5, 10, 15, 20, 25, 30, 35, 39) in the 13ht-century form of arabic numerals. 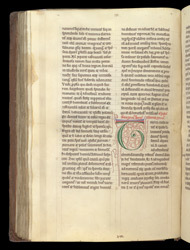 In the lower margin is a quire number in roman numerals, VIII, and at the extreme lower edge is a cropped guide to the rubricator and an equally cropped catchword.